As he cruises around some of the back country parts of his childhood home with brother Bob, Young sheds some humorous light on growing up, as well as taking a stroll down memory lane through the ghosts of buildings and structures no longer standing in Omemee. Much of these elements naturally make their way into Young’s music, hitting every sense from every direction. The most visually striking parts of Demme’s documentary are the up close and personal shots of Young’s spitting mouth, as he vocally blasts several songs in a very uncomfortable, yet intriguing manner. Young and Demme also visually pay tribute to the ‘Kent State Four’ in the classic, “Ohio,” the four young students who were killed during protests at Kent State University in 1970, through a blend of Young’s explosive solo performance coupled with archive footage and photos of the Kent State victims. What is still amazing about Young and his masterful performances of this new and classic material, he manages to fill the stage and atmosphere with the sound of a full band, though he is but one on stage, taking on lead and rhythm guitar distortions. 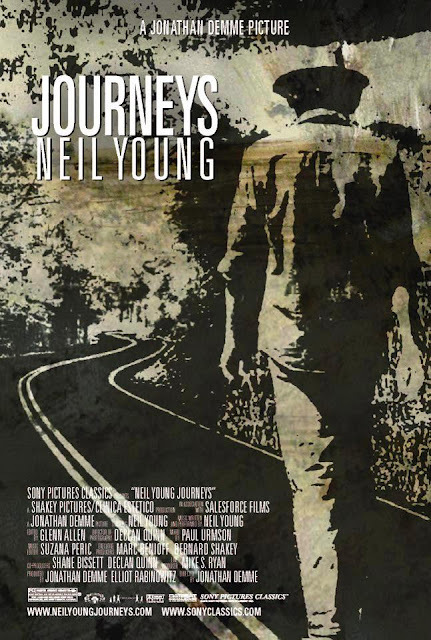 And, though Young certainly shows his visual age in this film, his songs and message are as youthful and powerful as anything he recorded 40 years ago. 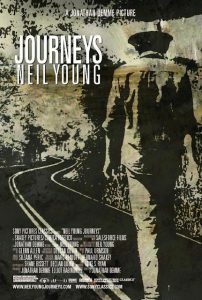 “Journeys” opens to select theaters across the country on July 20, 2012, and is distributed by Sony Pictures Classics. This entry was posted on Thursday, July 19th, 2012 at 4:26 pm	and is filed under Film, Music, Reviews. You can follow any responses to this entry through the RSS 2.0 feed. You can skip to the end and leave a response. Pinging is currently not allowed. « ‘Blade Runner: 30th Anniversary Collector’s Edition’ Blu-ray Announced and Detailed!!! You've read my files, right? You've seen the things I've done?